Sometimes you just need a good ole physical map of Cambodia. Whether it’s for a thorough backpacking trip, for pre-trip planning, or just to have it handy, there’s nothing like having an actual map in your hand. (Below you’ll find some good physical maps that are sold online). Sidenote : If you are looking for an actual map, you probably already know that there is a correct way of folding a map. But for those who doesn’t, folding a map properly keeps it in better condition longer, takes much less space in your bag, and most importantly prevents creases in places where it shouldn’t be, so you can easily read what’s actually printed. Although these days the physical map of Cambodia are made with sturdy materials that hold up better for wear and tear, careless handling will cause it break down faster. Who wants to decipher city names when two or three of its letters are blurred? In addition to the regular traveling maps, there are also antique maps of Cambodia. These are more interesting, although you can’t really compare the two. When I see these maps, I’m instantly transported to the olden age when Henri Mouhot just rediscovered Angkor Wat, or in 1920s where elephants roam around the temples for transporting tourists. Either way, if you’re an antique collector (or just fan old maps), some of these old maps of Cambodia are out there for sale. The Rough Guide Map Vietnam, Laos & Cambodia combines clear modern mapping and bang-up-to-date research and is the essential companion to anyone travelling around these three fascinating Southeast Asian countries. Whether you’re traveling through Ho Chi Minh City in Vietnam, Louang Phabang in Laos or visiting Phnom Penh in Cambodia , the Rough Guide Map provides invaluable information to help you find your way. It is printed on waterproof and rip-proof Polyart paper and includes detail on everything from road numbers and airports to train stations and main points of interest. Folded road and travel map in color. Scale 1:2,000,000. Distinguishes roads ranging from expressways to roads without surface. Legend includes tracks, shipping routes, coral reefs, international airports, airports, places of interest, scenic views, ruins, ruined towns, castles, beaches, pagodas. Includes extensive index. Up-to-date, detailed, highly readable map in shaded relief. Easy to fold. 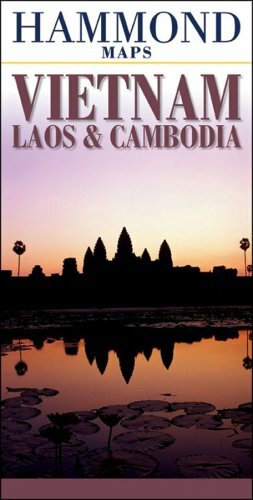 All of Cambodia with parts of Thailand and Vietnam.City maps show shopping centers/markets, hotels, Buddhist temples, Hindu temples, churches, mosques. Reverse has plans of the major temples of the Angkor sites: Bayon, Angkor Wat, Angkor Thom, Ta Prohm, Preah Khan, Banteay Srei; with historical information. Excellent clear and comprehensive mapping for the country with detailed insets for many areas. Points of interest are highlighted. Globetrotter Travel Maps cater specifically to the needs of tourists and visitors, packed with all the essential information to introduce travelers to each dynamic destination. Key buildings and places of interest are pinpointed, as well as where to stay. Distance and climate charts enable travelers to plan their visits, while stunning photographs conjure up each destinations’ special atmosphere. Folded road & tourist map of Vietnam, Laos, and Cambodia at 1:1,500,000 scale. Places of interest, national parks, and beaches are highlighted. Shaded-relief coloring clearly depicts topography. 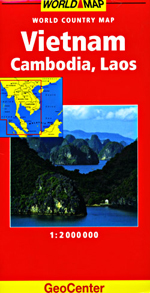 Insets include central Vientiane, Luang Prabang, Ho Chi Minh City (Saigon), Hanoi, Phnom Penh, and locator map. Hammond adds new editions to its line of quality road maps and atlases for the discriminating traveler. Printed on premium paper with a new attractive durable cover, they are a perfect travel companion for any exciting journey. Where is The Kingdom of Cambodia, exactly? This Google Map of Cambodia shows you exactly where it is. Have an idea where you’re heading before you go! An Angkor map will give you the quickest overview of Angkor Wat and it surrounding area. A picture truly does worth a thousand words. Learn simples phrases that earn smiles from the locals. It’s a great ice breaker and perhaps, just perhaps, they’ll be extra nicer to you for learning their language. If you have US dollars then you’re all set. There’s no need for you to change them to Cambodian Riels. Anyone and everyone will accept US dollars there. Well, except in the very remote areas.